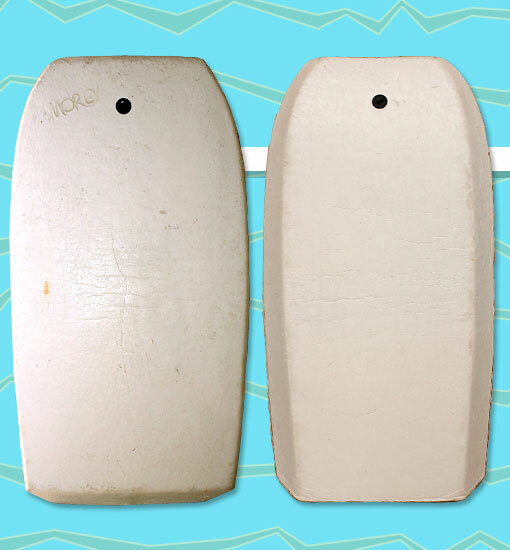 This very early Boogie Board was likely personally shaped by Tom Morey himself. This board pre-dates the 132BE model that used colored skins. The "Morey" stamp was made with an actual iron brand made by Tom. He and Bobby Szabad (who later created BZ) worked as a team to hand stamp each board. Judging by the thin layer of brownish yellow glue along the edges of the skins, this board was made before Morey began heat-welding boards. Photo: Shane Griffiths.